What was the reason that about 150 years ago the Swiss Johann Jakob Bachofen, descendant of one of the most distinguished families of Basel ventured to publish a thesis which was most appalling for the 19th century? It must have been his unbreakable conviction that his theory must be right, otherwise he would not have risked to lose his high reputation and his good name as respectable judge. He was the first one who held the position that there had been a phase in history of mankind when women were the predominating gender. He named this phase - Mother Right, today we use the term 'Matriarchy' or 'Matriarchate'. Johann Jakob Bachofen was the first one who fought for the acceptance of the matriarchy as historical fact. Like Don Quixote fighting windmills he struggled his whole life against the contemporary attitude that his theory of the Mother Right was nonsense. A critic of his time called his research 'higher rubbish'. Unfounded criticism, lack of understanding and mockery hurt him very much but it didn't stop him to go his way consequently. He didn't get any acknowledgment for his work during lifetime, only some decades after his death he has got a partial rehabilitation following the discovery of remote cultures whose society was matriarchal. What do we know about his life? 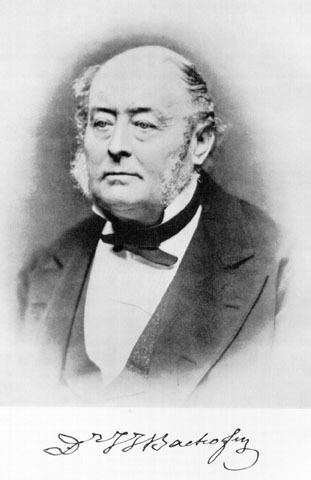 He was born on December 22nd, 1815, in Basel as the first son of an old-established rich family in Basel. His family owned a ribbon factory, the production of ribbons out of silk was the foundation of their wealth. The ancestors of the father had been merchants throughout but the family of Bachofen's mother, the highly respected Merian family, had brought forth many politicians and scholars. Already in school Johann Jakob Bachofen stood out because of his achievements. Also as student he excelled. He studied law and ancient sciences in Berlin and Göttingen. Already at an age of 23 he finished his studies with a voluminous doctoral thesis. Then he went to Paris and England for two year. At home again he soon became professor for Roman law, judge of his home town and got a political position. But after a few years he quitted the professorial and the political position. The reason why he did this was because he had been accused that he has got these positions only on account of his high social standing. For a quarter of a century he studiously worked as judge for his home town, but he complained: Can someone be more afflicted when he has the feeling to be selected for an office but it is impossible for him to do this One? Till the age of 50 he stayed unmarried and lived at home with his parents. In 1865 he married the beautiful and elegant Louise Elisabeth Burckhardt who was 30 years younger than him. In 1866 his one and only son was born. He kept in touch with many scholars and scientists throughout Europe, but he was also opposed to scholars whose theory he thought to be wrong. So he was a grim antagonist of the historian Theodor Mommsen whose critical historiography just accepted clear and definite historical facts. He undertook several long journeys to Italy, France, Spain and Greece where he did research intensively. Especially in Italy he found his fulfillment. So he mentioned in his autobiography that by feeling the splendour of the country he had led a richer life than any king of the world. The last two decades till his death (November 25th, 1887) he led the silent life of a scholar. Bachofen described his way of life in following word: In the deciding moments of life we rarely act in free self-determination. What seems to be our work basically is higher guidance. We think to choose our profession and actually we are chosen by it. His motto of life was: We are all constrained to put our goals higher than our strength permits to avoid that in the end we reach less than they allow. Finally his wish was: Not by the result, by the efforts I want to be judged. Alexis Giraud-Teulon Alexis Giraud-Teulon was one of the few ones who already recognized Bachofen's genius during his lifetime. The Genevan scientist was a great admirer of his »Mother Right«. 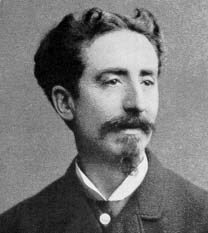 They much corresponded by letter, and thus Giraud-Teulon picked up many ideas of Bachofen and re-used them for his own research work. The esteem by Giraud-Teulon was a great mental benefit for Bachofen, because most contemporary scientists denied Bachofen's work and didn't take it seriously. In his book »La Mère chez certains peuples de l'Antiquité« (English: The Mother at certain peoples of antiquity) Giraud-Teulon picked up the idea of the Mother Right, but he transformed it in this way that he didn't see it as a general stage of human development but as a special appearance which can only be traced at certain peoples of antiquity. Actually, his point of view is widely accepted today. He assigned this special social order to pre-Indo-European cultures. So he traced a cluster of matriarchal peoples which spread from Asia Minor across North Africa till Spain and the Canaries, those were the ancient Carians, Lycians, Nubians (=Ethiopians) and Libyans. Concerning the Amazons he disagrees with Bachofen. He thinks that there had never existed Amazon nations. He believes that the Amazon myth has been inspired by matriarchal priestesses who carried weapons and defended their temples against the patriarchal invaders. The very first scientist, who most profoundly proved that there had existed an age when women dominated, was Johann Jakob Bachofen. You should read his well-founded theories in his book: Myth, Religion and Mother Right. If you are interested in matriarchal religion of the Celts, see his book: The White Goddess.